By the time I’d reached Aysgarth, I had only done 1 categorised climb, but noticed I’d already done 1,000 metres of climbing. It is really ‘rolling’ countryside, and the metres all add up. At Aysgarth you turn West for 8 miles towards Hawes. There is a minor road the other side of the river you could take, but the traffic on the A road to Hawes was quite light. 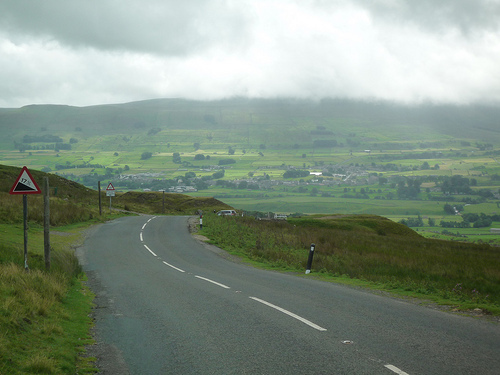 In Hawes, you turn right for the biggest climb up Buttertubs. I’ve done it quite a few times, and it never gets easier, though I was amazed at how smooth the road is now on the lower slopes. Another sign the Tour is coming to town! The road surface on the route was generally excellent (at least by the English standards we are used to!). But, it really does make a difference to the quality of the ride. I only brought one bike to Yorkshire, my time trial bike. But, going up Buttertubs I really wished I had the lighter road bike. It’s dedication to the cause to spend 7 hours on a TT bike in hilly Yorkshire, though my back was complaining plenty by the end of the ride. 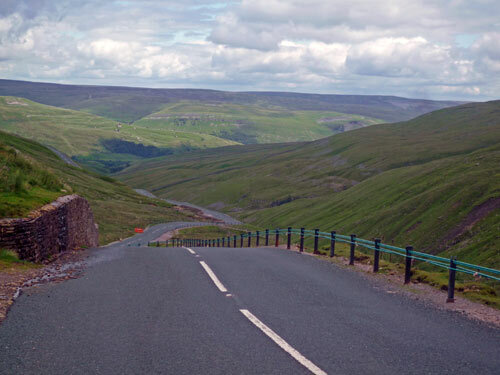 At the top of Buttertubs there is a fast, twisting descent to the next valley of Swaledale. 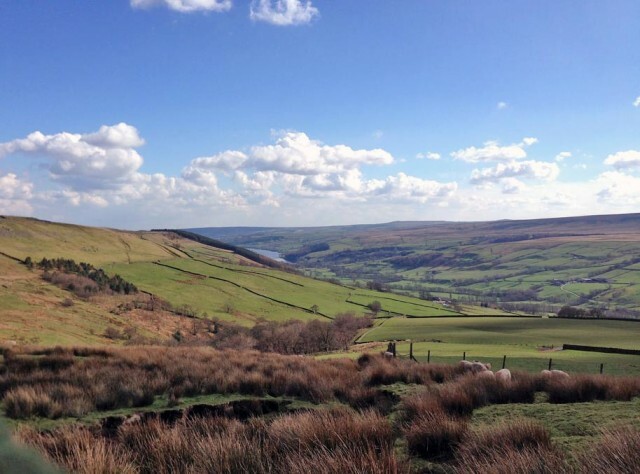 From Muker there is an eight mile stretch by the river towards Reeth. I really enjoyed this section because there was a light tailwind pushing you along the road. I hope the weather is good, because it really is fantastic scenery. I was torn between wanting to keep a good rhythm and stopping to take photos; there were so many good photo opportunities. 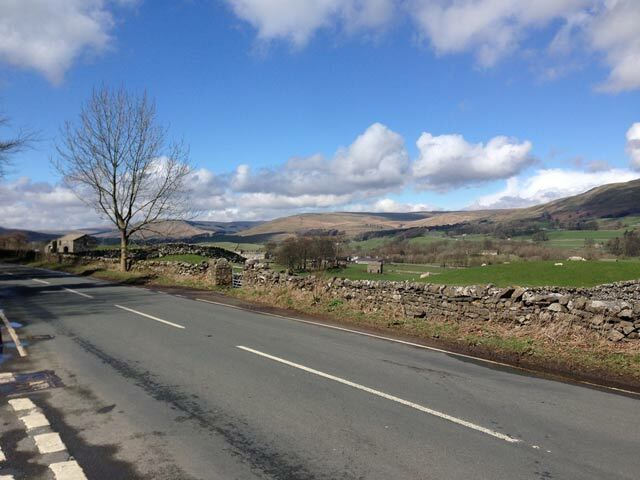 At Reeth, you turn south over Grinton / Ellerton Moor towards Leyburn. (I thought it was Grinton Moor, but Grinton is a right turn off this climb) This is the first time I’ve done the climb. (though I had driven over it a few times last year when travelling to the Stang). Again the smooth tarmac road is a delight. Though the gradient is pretty testing at the start, and even when you’ve got over the difficult first section, there is still a long way to go to reach the top of the Moor. Fortunately, the wind was quite mild, if there’s a headwind, it will really make life difficult. It is unlikely this last climb will provide a springboard for a late attack. It is difficult for most cyclists, but I guess it is too far out to really worry the sprinting teams. At Leyburn I stopped to top up on water and took the A road towards Masham, Ripon, and heading for the final sprint in Harrogate. The road is good, reasonably quiet and nothing too hilly. At this point, with 70 miles in the legs, I was taking it nice and steady plodding along at 18mph, 210watts. But, I did imagine the peleton screaming along at 28mph, with Omega Pharma and the like trying to reel in the remnants of any breakaway. I didn’t fancy cycling through Ripon and into the centre of Harrogate, so at Masham, I turned off the Tour route and headed West towards Trapping Hill and Lofthouse. It’s quite remote and I was surprised at how much climbing there was to get even to the foot of the climb by the reservoir. Trapping Hill, is not quite so difficult from East to West, but it still tops out at 432 metres or so. It is a real brute from the other direction (Trapping Hill). 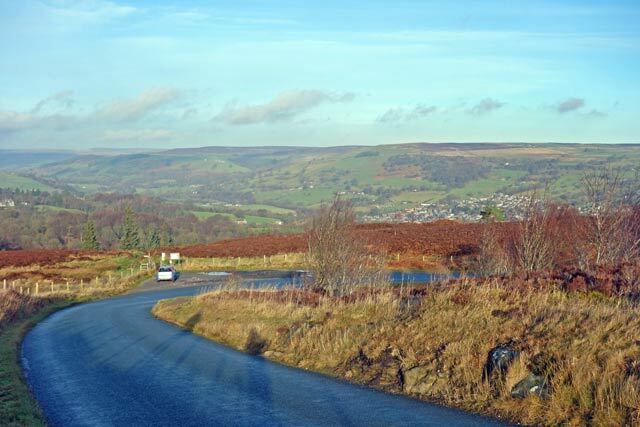 From Lofthouse, there is a great valley road which takes you down to Pateley Bridge. It’s hard to beat this road in spring, someone was once very enthusiastic with the planting of daffodils by the side of the road. 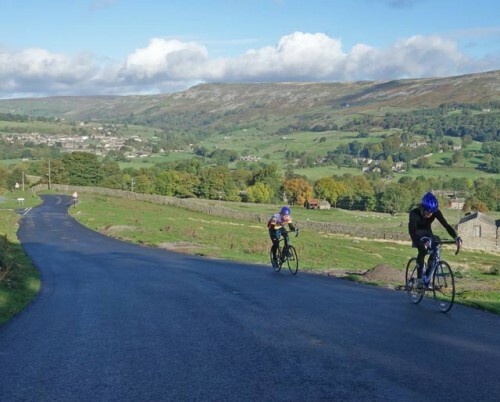 By, the time I’d reached Pateley Bridge, I had done 100 miles and over 2,000 metres of climbing. For want of a better description I was pogged. I hadn’t run out of energy. But, my muscles were tired after so much relentless 15% + gradients. I was now in survival mode – freewheeling downhill and going into bottom gear at the first sign of a hill. The problem is that in Pateley Bridge, the only way is up. The initial plan had been to go up Greenhow Hill (the route seemed so much easier looking at a map) But, I thought that Nought Bank road might provide a slightly easier and more direct ride home. I don’t often say this, but Nought Bank road really felt a hill too far. In other times, I’ve raced up this hill in just over 3 minutes to set a course record in the Otley CC hill climb. But, today I was just grovelling up, at the slowest speed my gears would allow. I wasn’t wishing for a compact, so much as wishing for a triple granny chainring – a 25 would have done a proper job. It was like someone had put 40kgs in my back pocket. At least I now know what it’s like to be a non climber, praying for the road to flatten out! I did finally make it – but, even at the top there’s still a lot of hilly roads over the moor to get back to Otley. I could have gone faster if I really pushed it, but it would have felt like flogging a dead horse. I got overtaken by an Ilkley CC rider hardly out of breath, showing how much I’d really run out of steam. It was a really great ride, especially the first 100 miles. The last 20 miles, were pretty tough; I perhaps bit off a more than I could comfortably manage, but then it’s good to push the boat out sometimes. It’s quite possible I went up the three major climbs in a similar time to the peleton will do in July. The only difference is the 180km in between. I was taking it nice and steady in between. The last 20 miles at snails pace, really trashed my average speed. It was great to do a Tour de France stage; it was also good to see the signs and banners of the road, you really feel something big is going to happen. I really hope the weather is good in July because it will look a spectacular stage on tv. 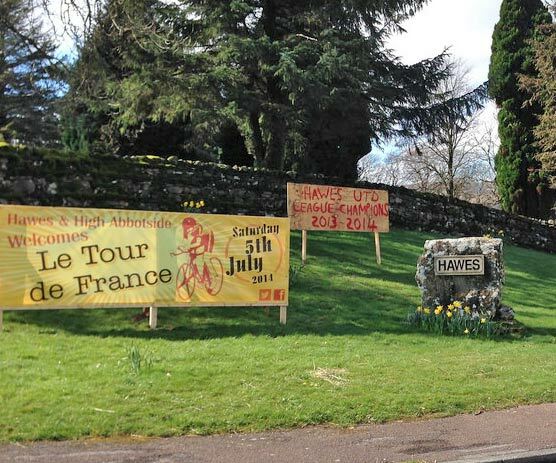 Next time, I do a Tour de France stage I may not be so keen to add on a few extra hills for good luck! The ironic thing is this stage is ‘relatively’ flat. But, it’s not often I manage 3,000 metres of climbing in a day. I’ll have to do a bit more training (and recover from this one) to be able to do stage 2, but I would definitely like to have a go. 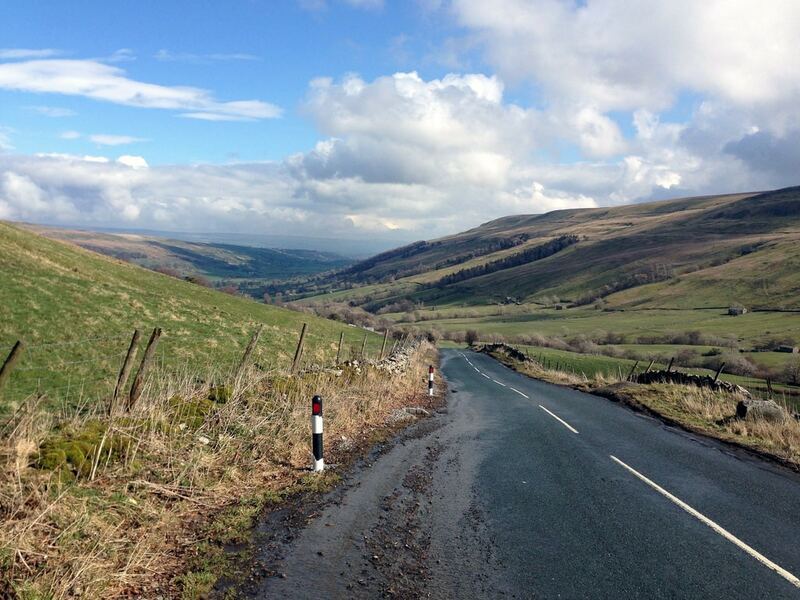 I may watch in Kettlewell, and then try ride over Park Rash to see the race come back down towards Masham. That might give two views for the price of one.